As the only tunneller awarded a Victoria Cross in the First World War, William Hackett provides inspiration, storyline and main character (renamed Bert) for this play by Oliver Lansley. Despite his heart condition, Hackett enlisted in late 1915. A few months later he was denied leave to visit his 14-year-old son, who had lost a leg in a mining accident. Then, on 22nd June 1916, he was trapped underground with four comrades by a German mine blast. Over several days he helped rescue three but died going back for the last. In this already cheerless saga, the amputation is replaced by news from home of a baby lost in childbirth, heightening perhaps Bert’s motivation to save his much younger colleague. To ramp up the melodrama further, the journey unfolds via a solid hour of iambic pentameter, spoken mostly by Bert (Lansley himself) as he scrapes and writhes through a claustrophobic set, aided by the multiple stage skills of Edward Cartwright, James Hastings and Kadell Herida, who play his comrades. The entombed ensemble is accompanied by the brooding presence stage left of the show’s composer Alexander Wolfe riffing dolefully on guitars, with sad melodies on sundry instruments occasionally aided by the multi-talented Hastings. If this sounds unremittingly gloomy, it is. On the upside, The Trench is the work of Les Enfant Terribles, a theatre company with its own brand of showmanship and production design. Samuel Wyer provides an explosion of visual ideas and techniques, which provide the energy needed for an otherwise plodding tale. Shadow puppetry is used especially well to depict sepulchral columns of doomed troops; high tension wires and projections combine to create a cinematic overhead camera effect as Bert stumbles through the mire of the battlefield. The team also depicts the horrors that Bert encounters with a series of demonic puppets resembling the rotting carcasses of rats and horses, culminating in a red dragon, a reference to the Red Dragon crater by which the area is still known. It’s hard to think what William Hackett would make of all this. Most likely he would enjoy the technical flair along with everyone else and may have recognised, too, the Music Hall style rhyming monologue, sustained from ‘A species on extinction’s brink’ all the way through to ‘The flickering flame of fate has faded’. Hackett might even have recognised Oliver Lansley’s actor-manager function but if so, probably wouldn’t have recognised himself. Hackett’s photos online suggest a less commanding figure than the one portrayed and a more vulnerable performance would have raised the emotional engagement hugely. 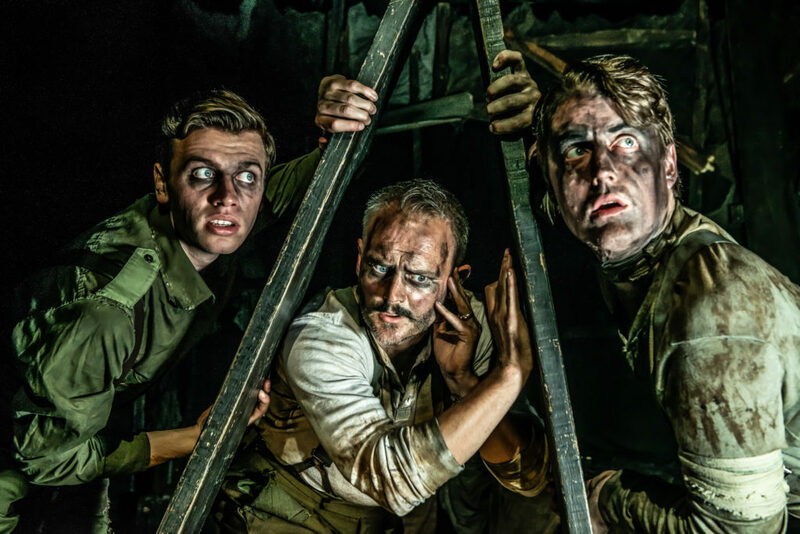 The glorification of WW1’s futile sacrifices can become a divisive subject especially at this time of year, but there’s no escaping that this is a slick, impressive show, so long as you don’t dig too deep.